I can’t believe that I am saying this, but the series about bicycle racing is progressing very slowly. I know that we are only at the third episode, but it feels like we have spent the entire series thus far watching Imaizumi racing Onoda. I was hoping that the race wouldn’t take up the majority of this episode, but it did. Did they show us a lot about racing? I guess so, but it feels like we aren’t getting anywhere. That is some new determination. The race has started up again now that Onoda received that power up. They just raised his seat, but the posture makes a big difference. What made this race interesting? Imaizumi slowed down because he knew that Onoda wasn’t finished. They revealed what type of cyclist Onoda is at this point. He uses a cadence to climb hills. This involves an increased RPM rather than putting weight into the pedaling itself. This is a style that is not often used, but Onoda developed it naturally over time. Unfortunately, his endurance should not hold up because Imaizumi trains more than seven times as much as Onoda. Also, the seat height wasn’t the only flaw with the bike. There was a smaller gear put into it that limits the speed of the bike. Once again, it is amazing that Onoda can do what he does on a bike like that. The race actually intensifies as Imaizumi has to get serious and Onoda draws on a hidden power. This is the determination of a young man who doesn’t have any friends. All Onoda wants is the opportunity to talk to people about anime and have a fun high school life. Unfortunately, he lost the race and Onoda is back where he started. He finally got that cycling club invitation, but he declined it. That won’t last long since the older guys saw the race. I like it, but they really need to speed up the pacing here. We got a lot of useful information out of this race such as technical cycling stuff and the determination of Onoda, but that is pretty much it. We know that he is going to join the cycling club and that he is going to be friends with Imaizumi. They are dragging this on far too long and they need to jump into the important stuff soon or they are going to lose some viewers. I don’t mind long races one things are established and they show the battles with the individual team members, but this didn’t need to take up this much precious time. At least I enjoyed parts of it I guess. I really got a sense of tension during the race when Onoda kept putting pressure on Imaizumi. That s something that isn’t easily achieved and I tip my hat to the writers for giving us a sense of tension. 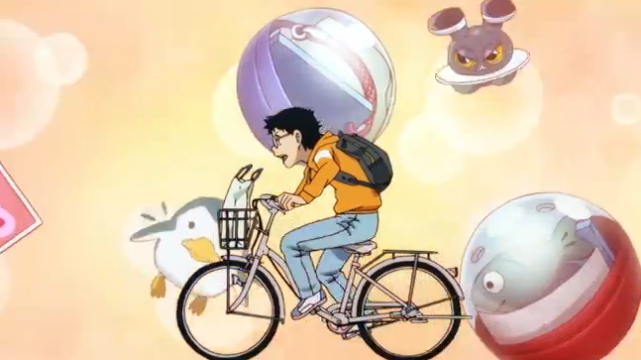 I would like to see Onoda jump onto an actual bike though. We all know that he is going to get a “training arc” even if it is quick. They can’t just jump into the real races when he can’t use a racing bike. I am hoping that we don’t get another unnecessarily long race between Onoda and the new kid. It is obvious that he is another freshman that is interested in joining the cycling club, so I want this to be the transition arc that will have Onoda learning how to ride a real bike. I want to get to a real race by episode six or seven if at all possible. I don’t think that I am asking for too much. I think that this series has some real potential and that means I want it to be good. Enough about that because there is something else that needs to be mentioned. I hope that they don’t disregard the anime club thing. Onoda is working far too hard to give up now. Friends made in the cycling club sounds great, but we all know what he really wants. I hope that he gets members for his club. Maybe the new guy would be compelled to talk about some anime and manga. From what I can tell, they are meeting each other in Akiba. That is a good sign. I know that I sound like a broken record, but these are my concerns and we really haven’t gotten far enough to give me any new ones yet. Well, the opening tells me that you are riding a bike down that path. Haha, the pace actually quite slow too in the manga. This episode ends at the beginning of 2nd volume, and I think there would be 2 more episode in akiba before Onoda join the cycling club.